A neighbourhood of small homes? It’s my dream that someday our little laneway will nestle in a neighbourhood of similar homes….up and down the lane. It’s also my dream that until that happens, our fellow laneway owners will gather together in a “virtual” neighbourhood online, and I hope that any lane dwellers will get in touch with me to see if that can come about. 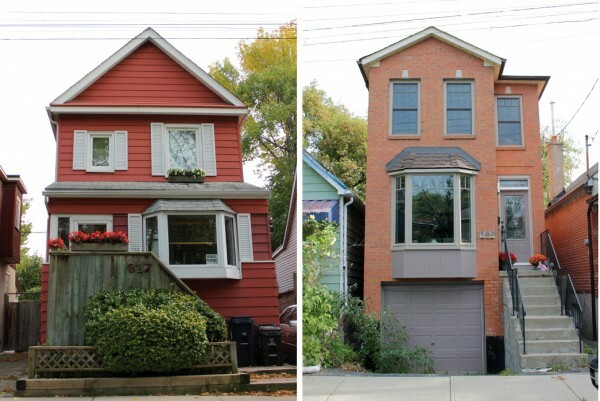 However, there is already a neighbourhood of homes of 500 to 800 square feet each — in Toronto. Craven Road was once known as Erie Terrace, but before that, these lots that now house tiny buildings were attached to the back of properties on Ashdale Avenue — properties that used to extend back from the road over 140 feet. Ridout says those who lived in the houses gave people materials to build places at the back of their lots. When there was a dispute over whose land belonged to whom around 1910, the City stepped in, expropriated the land, and created a tiny road between the houses on Ashdale and the rear lots. These homes remain, and are being cared for by their owners. They are charmers, aren’t they? And the homes that are being built in the neighbourhood continue the style and grace of the originals. Another common trait of the road is construction. Many people who have moved into tiny houses on the tiny street have decided to tear down their houses completely and start over from the ground up. With small lots, there isn’t a lot of room for expansion, but some architects have taken it upon themselves as a personal challenge to create the most innovative, modern, desirable designs despite the restrictions. Other people simply choose to add another floor on top of their house. But the thing that makes this neighbourhood truly stand out is the sense of community among its inhabitants. The one thing that hasn’t changed about the neighbourhood is that some strange force exists between the people who live on Craven Road, holding them together, as though the fact they all live in similar sized houses makes them more than just neighbours, but instant friends. The term “Tiny House Society” has even been thrown around, effectively making everyone on Craven members of the exclusive group. The voices of people saying hello and speaking with one another is common background music while walking down the street. I’m not sure how a virtual neighbourhood would work….we couldn’t make it exclusive — no passwords or secret handshakes — but friendly and open. Posted in Cities, Housing, Laneway House, Small House and tagged Lane Home, Lane house, Laneway House, Neighbourhoods, Vancouver. Bookmark the permalink.